Image, Congressional Pictorial Directory, 104th. EMERSON, Norvell William (Bill), (husband of Jo Ann Emerson), a Representative from Missouri; born in St. Louis, Jefferson County, Mo., January 1, 1938; raised in Jefferson County and attended public schools in Hillsboro; served as a page in the United States House of Representatives in the Eighty-third and Eighty-fourth Congresses; graduated from United States Capitol Page School, Washington, D.C., 1955; B.A., Westminster College, Fulton, Mo., 1959; attended University of Missouri Law School, Columbia, 1960; LL.B., University of Baltimore, Baltimore, Md., 1964; United States Air Force Reserve, captain, 1964-1992; special assistant to United States Representative Robert F. Ellsworth, 1961-1965; special assistant to United States Representative and Senator Charles McC. Mathias, Jr., 1965-1970; director, government relations, Fairchild Industries, 1970-1973; director, public affairs, Interstate Natural Gas Association, 1974-1975; executive assistant to chairman, Federal Election Commission, 1975; director, federal relations, TRW, Inc., 1975-1979; president, N. William Emerson and Associates, government relations consultants, 1979-1980; elected as a Republican to the Ninety-seventh and to the seven succeeding Congresses (January 3, 1981-June 22, 1996); died on June 22, 1996, in Bethesda, Md. Papers: 1980-1996, 255 linear feet. The papers document Norvell Emerson's service on House committees, including the Agriculture Committee, Public Works and Transportation Committee, and the Select Committee on Hunger. The collection includes correspondence, photographs, speeches and press releases, audiovisual materials, research materials, and newspaper clippings. A finding aid is available in the repository and online. Videocassettes: 1988-1994, 29 commercials on 4 videocassettes. 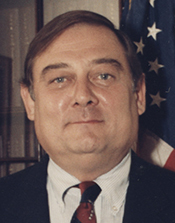 The commercials were used during Bill Emerson's campaigns for the 1988, 1990, and 1994 U.S. congressional elections in District 8 of Missouri, Republican Party.